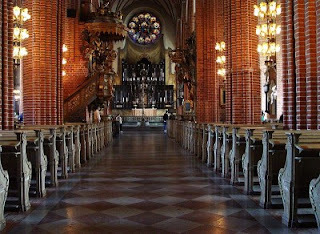 Stockholm Cathedral. Photo by Jürgen Howaldt. It is no secret that on 19 September 2010, Sweden Democrats, a hard line extreme right political party was voted into parliament for the first time since it was founded in 1988. You would agree that the results of this historic parliamentary election clearly indicated that an increasing number of Swedes share the polarising ideology of the Sweden Democrats. Meanwhile in Sweden, dust is yet to settle after the extreme right electoral gains as Sweden Democrats have been on the headlines for all the wrong reasons. The most recent drama staged by the party was a walkout of church on 5 October 2010 over a sermon about racism and xenophobia. “Yesterday evening thousands of people gathered in Stockholm and in various parts of the country to make their voices heard. To call out their disgust at that which divides people. The racism that says that you don’t have as much worth as I do; that you shouldn’t have the same rights as me; aren’t worthy of living in freedom..."
Sweden Democrats' parliamentary delegation considered the sermon to be an attack against them, hence walked out of church in protest. The party has tried over the years to distance itself from racism and xenophobia, but its manifesto suggest otherwise. While it is true that this walk out in protest against a racism sermon could be attributed to an attempt by Sweden Democrats to score political points, it is also true that racism and xenophobia have no place in a free society and should be unequivocally denounced wherever "two or three" lawmakers are gathered.